Net income is the bottom line of the income statement. It is what is left over from revenues after all costs and expenses are subtracted. Revenue – cost of goods sold (for manufacturing businesses, or cost of services for service businesses), operating expenses, taxes, interest, one-time charges, non-cash expenses such as depreciation and amortization, and any other costs not included in operating profit leaves the net profit. 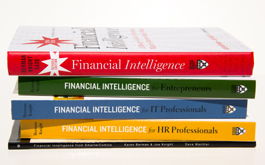 Net profit, net income, and net earnings all mean the same thing. 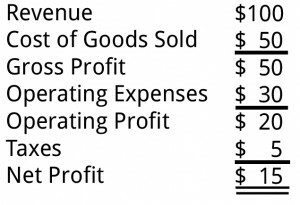 Here is a sample income statement to show how net profit might be reflected on the income statement of a small, hypothetical company. Amounts shown in thousands. When someone asks, “What’s the bottom line?” he or she is almost always referring to net profit. Some of the key numbers used to measure a company, such as earnings per share and price/earnings ratio, are based on net profit. Yes, it is strange that they don’t just call it profit per share and price/profit ratio. But they don’t. Nonprofit organizations use the same financial statements as for-profit companies, including the income statement. They also have a bottom line indicating the difference between revenue and expenses, just like for-profit companies. Sometimes the bottom line has a different label, but it is still a profit or a loss. And the fact is, a nonprofit organization needs to earn a profit. How can it survive over the long haul if it doesn’t bring in more than it spends? It has to earn a surplus to invest in its future.